It’s an exciting time and you’re looking forward to spending the day on your new pleasure craft out in the open waters of a lake, river, or even the ocean. What are some of the most important things to know? Whether you’re new to nautical life or have been boating with friends or family for years, it’s always a good idea to familiarize yourself with the relevant boat terms and definitions, and remember what they mean and how they’re used. Learn more about our high-quality marine fabrics. Contact us today! If you’re just starting out, this introduction will help you quickly get up to speed, and if you’ve had years of experience on the water, it can serve as a handy refresher. Everything from buying accessories to protecting your boat from the elements to properly performing maintenance will seem easier. When going into a boating equipment store, a good background in these terms will help you find what you’re looking for faster. You’ll know all the key parts of your boat and it will make communicating about it a cinch. Aft – a directional term; toward the stern (back) of the boat. Forward (or Fore) – a directional term; toward the bow (front) of the boat. Abeam – alongside the boat. Astern – a boat moving in reverse. Port – the left side of the boat when looking forward. Starboard – the right side of the boat when looking forward. Leeward – the direction away from the wind. Windward – the direction the wind is coming from. Heading – the boat’s direction at any given time. Yaw – to swing away from the intended course. Bow – the forward (front) end of the boat. Cabin – the enclosed area of the boat. Deck – the exposed part of the boat that people stand on. Fender – an inflatable cushion used to protect the sides of the boat from contact. Helm – the wheel or tiller that controls the rudder (steering). Hull – the portion of the boat that sits on the water. Hulls come in different shapes depending on the specific boat time. Keel – the centerline (or backbone) of the boat running back (aft) and fore; it’s also the lowest portion of the boat. Line – a rope or cord used on a boat. Rubrail – the outer protective element on the sides of the boat that help protect the hull from damage. Rudder – a vertical appendage from the hull that’s directed by a wheel; it controls the boat’s steering. Stern –the aft (back) part of the boat. Toe-rail – a rail located around the outer edge of a boat’s deck, usually where the hull sides meet the deck. Transom – the aft-most (back) section of a boat, it’s a horizontal beam that connects the two sides of the hull. Waterline – the line around a boat’s hull where it intersects the water (i.e., how much of the boat is underwater). 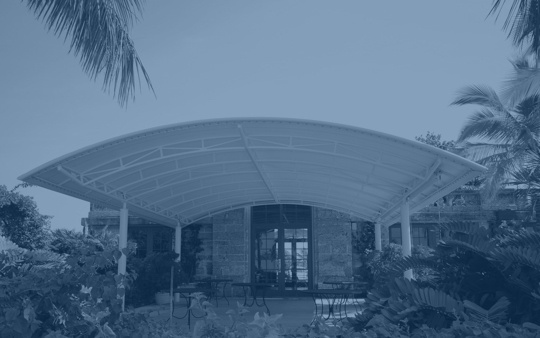 Bimini Top (or just Bimini) – a top supported by a metal frame that provides shade as well as some protection from rain. The quality of fabric largely determines both how long the top will last and the protection it provides. Boat Cover (or just Cover) – a cover put over your boat while storing it. This is important element that safeguards your boat when it’s not in use. Higher quality fabric provides better protection. Marine Enclosure (or just Enclosure) – this is a clear material that is used to close off portions of your boat from the elements. It functions like a window. The best of these are scratch-resistant and made out of long-lasting material. Stern-drive – inboard engine that also has a steerable drive system mounted to the transom. Pod-drive – inboard engine with drive units that protrude from the bottom of the boat. Outboard Engine – an engine that is typically mounted to the transom of a boat as a self-contained, detachable unit. Aground – when the boat touches the bottom or is stuck in it. Draft – the depth of water a boat draws. This will give you an idea of the minimum depth of water a boat can be in without going aground. Mooring – an anchor or weight used with a line to hold a boat in place. Wake – moving waves that the boat leaves behind it, similar to a path or track. Knowing this basic terminology helps ensure you’re conversant in the language of boating and enriches your experiences on the water. If you’d like to learn about nautical terms, a more comprehensive, A-Z list can be found here. And here are some tips and advice for new boat owners. Happy boating! Interested in learning more about the benefits of our high-quality marine fabrics? Contact us today for more information!